On Thursday, July 20, 2017 in Nevada, a parole board granted 70-year-old O.J. 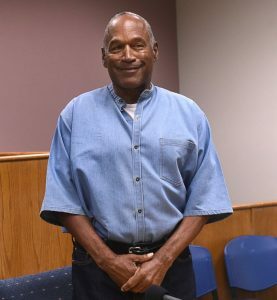 Simpson parole, after having served the minimum nine years of a nine-to-33-year sentence for his role in a 2007 armed robbery and kidnapping in Las Vegas, which many people felt was payback for the 1995 acquittal he received by a jury for the brutal murders of his ex-wife, Nicole Brown Simpson, and her friend Ron Goldman. Simpson is expected to be released as early as October 1st, and was visibly relieved and grateful after receiving the unanimous vote to grant him parole from the parole board. Simpson said he plans to move back to his home in Florida, and upon his release is slated to receive millions of dollars that have been continuously accruing from his monthly NFL pension, Screen Actors Guild pension and personal pension he invested $5 million in many years ago.